EVERY DOOR DIRECT MAIL Printing. EDDM Postcards, Brochures, Menus and Flyers. Every Door Direct Mail (EDDM) is a USPS service offered by Cloud 8 Printing Columbus, OH. EDDM is designed to help small businesses market themselves to their local community, regional prospects or throughout the U.S.A.. You don’t need mailing lists with specific names or addresses. You just need to know the zip code of any neighborhoods you want to contact. EDDM is an affordable way to expand your company’s reach. EVERY DOOR DIRECT MAIL PRINTING is a great service if your company is looking to add a local marketing campaign. Cloud 8 Printing can help you learn more about the EDDM program whether your business is located in Columbus, OH or anywhere in the U.S.call us at 614/273-0845 or click on the Get A Quote button at the top of the page.Cloud 8 Printing Columbus, OH offers Postcard sizes that meet EDDM specifications. Common sizes are 4.25″ x 11″, 6.25″ x 9″, 6.25″ x 11″ and 8.5″ x 11″. These all meet USPS requirements for EVERY DOOR DIRECT MAIL PRINTING. Simply print your Postcards, flyers or brochures, fill out the U.S.P.S. paperwork and take them to the neighborhood post office for mailing. Need help filling out the paperwork for EDDM. Call Cloud 8 we will be glad to answer any of your questions. Many smaller businesses prefer to market locally.EVERY DOOR DIRECT MAIL PRINTING is perfect to target the specific neighborhoods where you already know your best prospects live. For example, a local pizza restaurant may target a 5 mile radius near college areas near OSU campus. While a law firm targets downtown or areas with a lot of office buildings. So if your business is in Hilliard, Dublin, Columbus or Westerville Cloud 8 Marketing can help you with a Every Door Direct Mail marketing plan aimed to your town or anywhere be it Columbus, elsewhere in Ohio or across the country. And all for 18.7 cents postage per home.Getting started with Every Door Direct Mail (EDDM) for the first time may be a bit confusing, so we highly recommend calling Cloud 8 Printing at 614/273-0845 or reading all the details and downloading the information that the USPS offers on their website.EDDM is a great option if you plan on sending mailings 3 or 4 times a year. Once you get it setup and are familiar with the process, it can save money. However, if you don’t plan to send mailings out geographically and want to target a customer mailing list, it’s likely a smarter option to use regular direct mail services. It is always good to compare different programs. Every Door Direct Mail (EDDM) is a service offered by the USPS designed to help small businesses market themselves to Columbus, OH or any other local community in Ohio, the Midwest or anywhere in the USA. You don’t need specific names or addresses; you just need to know the zip code of any neighborhoods you want to contact. It’s an affordable way to expand a company’s reach. Every Door Direct Mail (EDDM) is a discounted service offered by the USPS for 18.7 cents per card. EDDM is designed to help small businesses market to their local community. ie: In Columbus, OH you can send Every Door Direct Mail to Hilliard, Dublin, Westerville, New Albany, Powell or any town in the Greater Columbus, Ohio area. Or mail to Marion, Lancaster, Delaware OH, across the state or across the USA. Wherever your customers are EDDM can work for you! You don’t need mailing lists or specific names or addresses; you just need to know the zip code of any neighborhoods you want to contact. 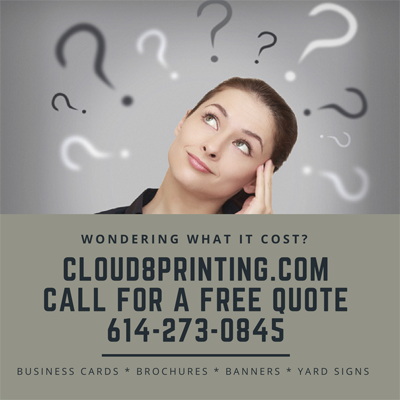 Need help with that call, email or text Cloud 8 Printing and Marketing 614-273-0845. It’s an affordable way to expand a company’s reach. Call, text or click red quote button for free quote. Postage as low as 18.7 cents a home. It is cheaper than bulk mail and arrives at your recipient’s home sooner. Addressing is simpler. No need for bar coding. No need to buy an expensive mail permit. Every Door Direct has a few rules and restrictions. Call Cloud 8 if you have questions 614/273-0845 about how to address or layout your EDDM postcards of any of the restrictions below. You must mail to complete postal routes (subgroups of zip codes about 200 – 800 homes each). You have to mail a flat piece (no letters) and size restrictions apply. You have to drop them off at the appropriate Post Office location. You are limited to mailing no more than 5,000 pieces on any one day per zip code. You need to prepare your bundles according to USPS specs. We offer Postcard sizes that meet Every Door Direct Mail specifications. Simply order the Postcards, fill out the paperwork, (call Cloud 8, we can do or help lead you through the paperwork) and take them to the neighborhood post office for mailing. Cloud 8 Printing can explain your mailing options and tell you about Post Office’s USPS solutions for businesses of all sizes and marketing goals. Many smaller businesses prefer to market locally. They can use EDDM to target specific neighborhoods ie: say Muirfield, Dublin, but not east of the river. Or for example, a local pizza restaurant may target a 5 mile radius near Ohio State campus (OSU) while a law firm targets Dublin, Hilliard or areas with a lot of office buildings like downtown Columbus, OH. Full Service EDDM or regular Direct Mail. Most every post office participates in EDDM, But you can check by letting us know which postal route you want to reach or what geographic area.If you prefer to find the postal routes yourself, you can use the USPS mapping program shown below. Begin by entering a zip code you want to mail to in the search bar. For more details about EDDM EVERY DOOR DIRECT MAIL PRINTING call Cloud 8 Printing Columbus, OH or, click here to visit the USPS site.